“What is your favorite movie?” This is a fairly common question and a good conversation starter as well, because we can learn so much about a person from the answer. Yet I always resist answering. I don’t like being tied down to “one favorite” regarding anything subjective or derived from artistic preference. I love nuance, which cannot be compared, let alone ranked. However, on occasion I might make an exception if asked about naming my favorite movie. And my answer would be Mr. Holland’s Opus. Mr. Holland’s story affects me in countless ways, as does The Razor’s Edge. Both movies are well steeped in nuance and the meaning of life. Richard Dreyfuss was nominated for an Oscar for Best Actor in Opus, and for good reason; it’s a great screenplay also, and is simply an enjoyable movie on all accounts. Mr. Holland’s Opus is among my favorites (obviously, my top 5) for these reasons, but is perhaps my favorite movie overall for three distinct reasons. First, out of “temporary” financial necessity Mr. Holland finds himself agreeing to a take a slight detour from dedicating all his time to composing the symphony that would make him famous. His “fallback plan” is to teach music for four years and compose during the summer. When I made a similar necessary and “short-term” career move early in my career, I found myself on a completely new path of life, love, vocation and purpose that lead me on a wonderful nine-year journey of discovery while adding value through my role and relationships. http://rcm.amazon.com/e/cm?t=msturgell&o=1&p=8&l=bpl&asins=6305428352&fc1=000000&IS2=1&lt1=_blank&m=amazon&lc1=0000FF&bc1=000000&bg1=FFFFFF&f=ifrSecond, Glenn Holland’s story is a story of flaws, failures and a series of “crises of character”, yet his “opus” is the score for deep positive impact that his life creates in the lives of others, including family, peers and especially his students. Third, I relate to Mr. Holland’s relationships, two in particular. The first relationship involves Principal Jacobs (played by Olympia Dukakis) and the particular scene when she notices Holland’s lack of engagement (resentment, really) in his role as band teacher. She calls him on it, and it works effectively as his wake-up call. “A teacher has two jobs. Fill young minds with knowledge, yes, but more important, give those minds a compass so that knowledge doesn’t go to waste. Now I don’t know what you’re doing with the knowledge, Mr. Holland, but as a compass you’re stuck.” Principal Jacobs. 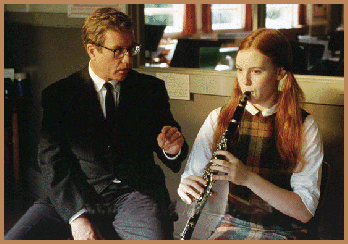 We see the effects of Mr. Holland’s epiphany, which he apparently has after the wake-up call his principal so sternly provides, in what I’ll venture to say is my favorite scene in this movie: “Gertrude and her clarinet” (click the text link or watch in viewer below). Holland doesn’t give inspiring sermons; he asks Great Questions, and I am in the business of asking Great Questions, so I love this scene. It makes Holland. I appreciate the scenes from my own life that made me. “Is it any fun?” Mr. Holland asks his meek student named Gertrude, perhaps reflecting the question he must ask himself about his current “lot in life”. And he asks, “What do you like best about yourself?” knowing that self-love is the beginning of all things meaningful. This scene is the turning point for two lives: Gertrude, who gains confidence in her own uniqueness that will make her’s a truly great life in the end; and Holland who recognizes that, despite his dreams, there is purpose and power is the ability to love and teach others to be their best. It’s not about the direction you take. It’s about the direction you give. I hope this short series of brief introductions to the movies that reflect my character will inform you, inspire you and cause you to consider Great Questions that help determine your purpose, your values and your character as well. As a result, I hope you will watch these movies again or for the very first time and enjoy them as I have, over and over. This blog is my constant invitation for you to place a higher value on being remarkable in the lives of others, rather than seeking fame or fortune. You have a great story, too. Allow yourself time to make sense of serendipity and the common things in your daily life that make your life extraordinary. If I can help, email me at askthecoach@pdncoach.com or call me at 217.362.0500. This entry was posted in learning, mission, movies, Purpose, values, vision. Bookmark the permalink.